My man xtop was just announced as the writer for the AvP series at Dark Horse and I couldn’t be more excited for him. Quick story: Growing up, my best friend across the street had these really lax parents who would let him and his brothers watch, literally, anything. I’m talking 8, 9, 10 year olds watching Friday the 13th, Nightmare on Elm Street, Halloween… anything. Most of those seemed a bit much for me at the time, but I was desperate to see ALIEN. So one Halloween I was at the video store with my folks (we had to rent a VCR, this was a thing poor people used to have to do). I was sheepishly walking through the HORROR section and I spied ALIEN. My parents were reasonable people, so they of course wouldn’t let their 10 year old watch this rated R movie. For whatever reason (and believe me when I say I was not the type of kid who normally did this), I lost it. I was crushed and inconsolable, and had to be taken out to the car while my parents checked out. I don’t know what divine intervention blessed me that night, or what temporary insanity gripped my folks, but I was shocked to find ALIEN suddenly beginning on my television that night when we got home. It was the first rated “R” movie I ever saw and it remains one of my favorite movies to this day. So thanks for my parents to caving just that one time. 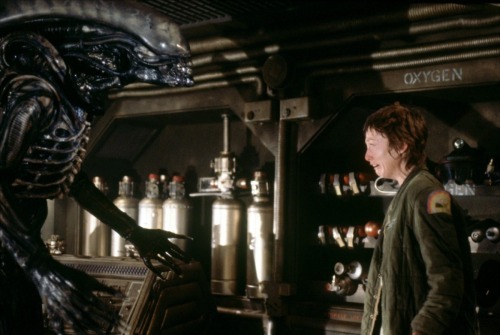 I had this gigantic picture book of horror movie history as a kid and there was a double-page still from ALIEN of the xenomorph getting all up in Veronica Cartwright’s face and her understandably freaking out and I used to stare at it and stare at it and freak myself out trying to fill in the blanks of what had to be an unbearably terrifying movie just based on this one still. I think my mom would have let me see it, but I couldn’t even handle the concept of whatever the hell that thing was and the look of sheer terror on her face. And that’s the first time I ever knew what Aliens were.